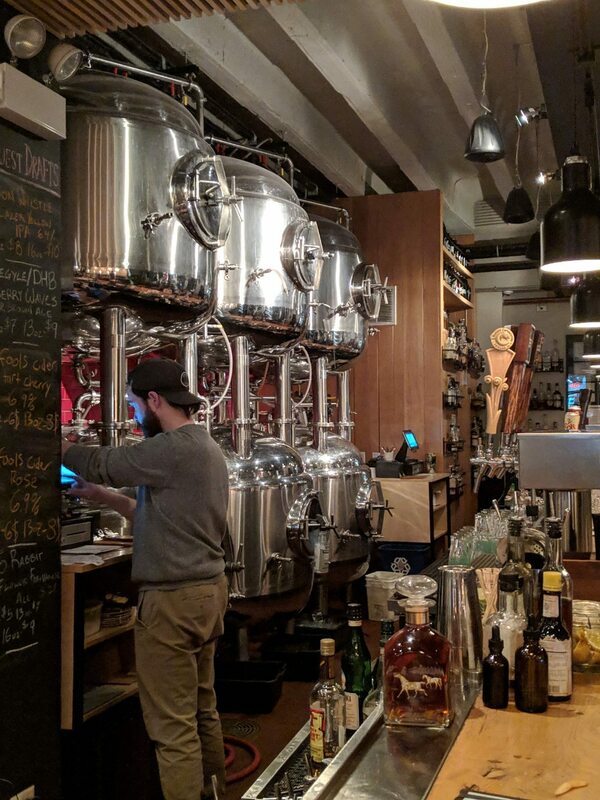 DryHop Brewers (3155 N. Broadway Ave.) is a microbrewery that’s home to a vibrant, knowledgeable and kind-hearted staff. Its beers are only available at the brewery, which makes them a treat to drink. DryHop Brewers is located off the Southbound CTA 151 Belmont stop or a 10 minute walk east on Belmont off the CTA Red line. I nestled into a bar stool and introduced myself to Robin, the bartender. Robin is a bald man with a defined beard, squared glasses and a crossword addiction. Side note, the staff at DryHop are crossword sorcerers, so if you’re the looking for the fight club of crosswords, look no further. Robin recommended I try the Le Fin de Carnaval, a love-child between a stout and hot chocolate. Floating at 7.1 percent alcohol by volume (ABV), this stout was going to be fun. Close your eyes and imagine this. You’re sitting alongside a rainy window. As cars softly hum by, the rain begins its aerial assault. Spring has arrived. In your hands, you have a pint of pitch-black beer. The smell is that of dark cocoa and cinnamon. As you bring the beer to your lips, you taste churros drizzled in dark chocolate. A slight spice awakens the back of your throat, balancing out the sweetness. I’m not the type for dessert-style beers like this but it struck some kind of a chord in me. In that moment with the rain pouring down, it felt right. 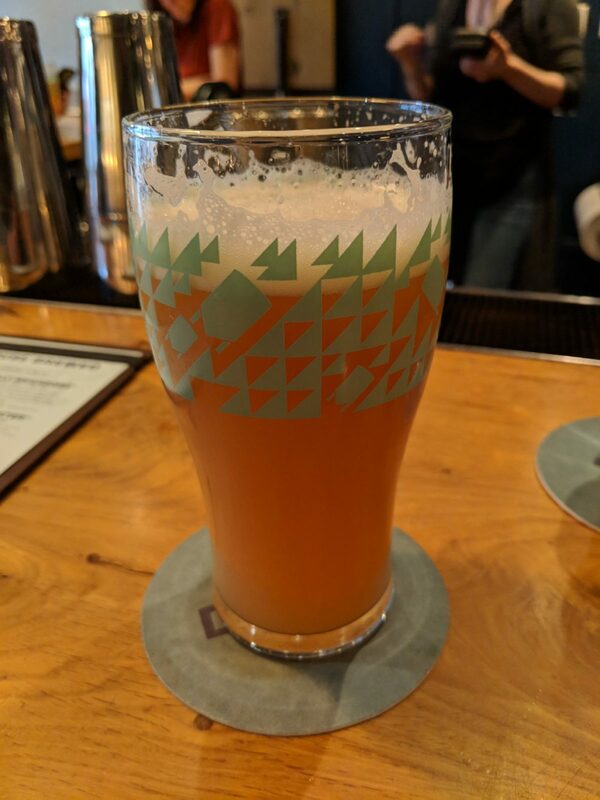 Robin readied another beer for me as I ordered some food — I learned my lesson from Hop Leaf. Food is necessary when binging beer. A sizzling plate of poutine (fries covered in gravy and cheese) arrived along with my second drink. 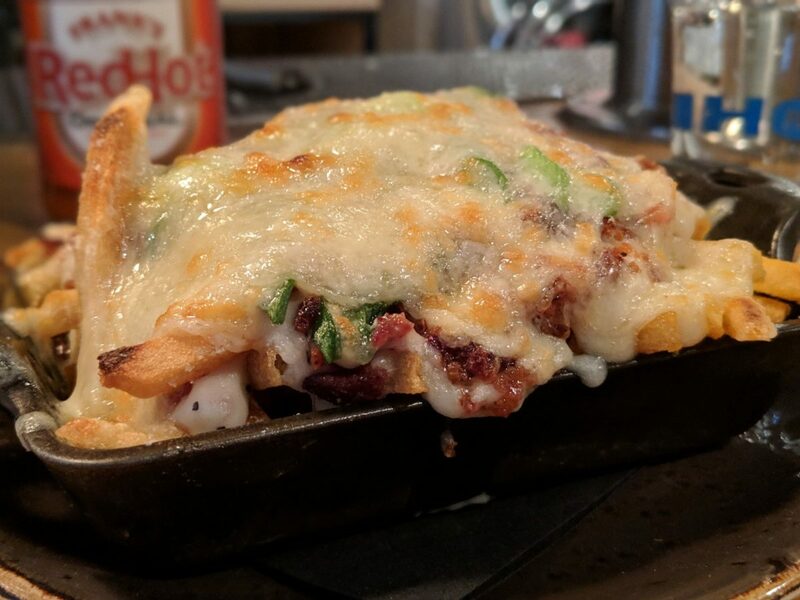 The poutine was covered in aged white cheddar, crispy bacon and a white sausage gravy. I almost didn’t breathe while I devoured my food. Washing down my rich snack was a pale ale called Practically Neighbors. It’s brewed with Simcoe and Galaxy hops that give off a tropical fruit aroma. The hops resembled mango, pineapple and kiwi in both aroma and taste. It was slightly bitter with a smooth and pleasant flavor throughout. I had two more pints of this and relaxed for the rest of the night. I spoke to other staff members and began to understand they have a strong relationship with some of the patrons. Staff would often reminisce about wild nights they had with patrons, smiles were a constant and laughter echoed throughout. I noticed a staff member filling out a crossword and intervened, “Can I help?” That’s how I realized they all do crosswords in their down time. I hope that one day they change their names to Crossword Brewers, but until then, I’ll keep my mouth shut. I had a wonderful time drinking the beers and annihilating the food. DryHop Brewers’ 16-ounce pints average $6-$7 and the poutine was $7. Once you fall in love with these beers like I did, you can take a growler — 64-ounce jug — of that beer home with you. Check it out at www.dryhopchicago.com and tell Robin that Jacob sent you.